COBBLE HILL — Two bidders that are submitting proposals to take over Long Island College Hospital will offer only a small number of beds and emergency bays in their proposed “freestanding” emergency departments, according to sources and officials. The Brooklyn Hospital Center is proposing some 15 emergency room bays for both adult and pediatric cases and about 10 “observational” beds in its 24-hour freestanding emergency department, officials told a community meeting in Red Hook on Tuesday night that was organized by the hospital. Another proposal from Fortis Property Group, which is partnering with NYU Langone Medical Center, would have four “observational” beds and 10 to 12 ER bays, according to sources familiar with the plan. An observation bed is a place where a patient would be “kept and monitored and followed,” said Joan Clark, senior vice-president of planning for Brooklyn Hospital Center. Emergency room bays are areas reserved for patients to be treated for illnesses or injuries, after which they will be sent home or transferred to a full-service hospital for further care, she said. Patients will not remain in the ER for more than 24 to 48 hours, said Dr. Richard Becker, CEO of Brooklyn Hospital, which is partnering with Mount Sinai Hospital and developer Related Companies for the proposal. Both plans would scrap LICH’s 15,000 square-foot emergency department, which has five “pods” of care, including cardiac, asthma, pediatrics, adult and fast-track, along with a separate psychiatric ER, according to the hospital's website. Nurses said there are about 40 emergency room bays at LICH. “That’s not enough,” said Gloria Ramnanan, a nurse at LICH’s emergency department, who attended the meeting in Red Hook. A spokesman for Fortis and NYU declined to comment on the proposal details since the final plans have not yet been submitted. Developers and healthcare operators have until March 19 to submit their proposals. Last month, officials praised the settlement that would ultimately determine LICH’s future but would not guarantee a full service hospital or its continued operation after May 22, when the State University of New York gives up control. While proposals that have more medical services would be awarded more points and consequently have a greater chance of being selected, as per the settlement, neither Brooklyn Hospital nor Fortis were offering full service or teaching hospitals, as of this week. At Tuesday night’s meeting, a small number of nurses, Red Hook residents and supporters of LICH attempted to spur Brooklyn Hospital into offering a full hospital or even a facility with more beds. But the hospital officials seemed unlikely to amend their proposal, community members said. “We’re telling you what we want, you’re telling us what you intend to give, and that’s it,” said Beverly Jones, a Red Hook resident. Becker said the proposed LICH ER would treat all but the “most severe types of emergencies,” and would address “90 percent of people’s needs” before patients were transferred to Brooklyn Hospital Center in Fort Greene — less than two miles from LICH. ”Every time you transfer those people, you’re putting their lives at risk,” said Kimberly Gail Price, a senior editor at the Red Hook Star-Revue, a community newspaper. 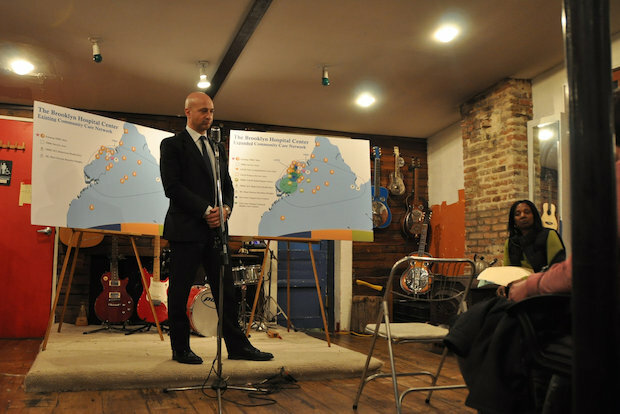 Brooklyn Hospital would also open an urgent care center and a primary and specialty clinic in Red Hook to expand its wide hospital network that stretches throughout the borough, Becker said. The plan could also involve extending the footprint of the Joseph P. Addabbo Family Health Center at 120 Richards St., if the center’s board approved of the partnership.